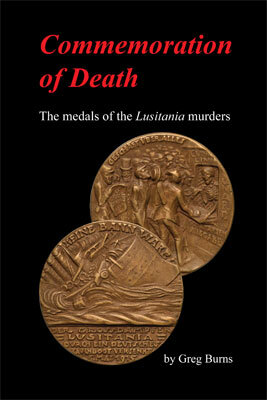 Just in time for readers to appreciate the centennial commemoration of the controversial sinking of the Lusitania on May 5, 1915 and the loss of 1,198 lives, the book, “Commemoration of Death: the medals of the Lusitania murders,” has been released by author Greg Burns. An examination of the most infamous medal of celebrated Munich medallist Karl Goetz: the history of the wartime origins, photographic guide to the different varieties and reproductions, value information, other medals relating to the Lusitania, and related ephemera (boxes, pamphlets, postcards, etc.). The book allows readers to determine whether they are looking at a common medal worth perhaps $20, or a rare specimen that could fetch $600 or more. Full color, 194 pages, softcover. Shipping $5.00 USPS Priority Mail. Email for shipment price outside the U.S. Please order using our email account as this book ships from another location.